Origin: The boojum tree naturally grows on rocky hillsides and alluvial plains from the southern Sierra de San Pedro Martir, to the Volcan Las Tres Virgenes, and on Angel de la Guarda Island all along the Baja California peninsula. There is also a separate population of boojum trees on the Sonoran mainland of Mexico in the Sierra Bacha, south of Puerto Libertad. The peculiar distribution pattern of the Sonora mainland boojums has led some Mexican botanists to conclude that they were probably transplanted to the mainland by the indigenous Seri people, who lived in this area and still live on communal property south of this location. The Baja boojum tree forests in the Vizcaino region often are intermixed with with yuccas, ocotillo, and cardon (large saugaro like cacti). Landscape Use: A strong and visually dominant landscape focal point once it attains size, botanical oddity, collecters plant, container plant when smaller. Form & Character: Extremely stiff and upright, imposing, striking. Growth Habit: Mosly deciduous, biologically active during winter, sarcocaulescent (stem succulent), VERY SLOW (over multiple decades) growth to 50 feet, over a LONG, LONG time will develop a trunk with up to a 24 to 30 inch caliper, many short stiff slender branches grow at a perpendicular angle from the central trunk. Here's a picture of a 22-year old boojum tree in a Phoenix landscape, it's still a runt! Foliage/texture: In Phoenix, generally leafless during warm season, otherwise green sessile 1 to 2 inch leaves are grown on the short slender branches during the winter wet season and occassionally during summer if well irrigated or if summer monsoon rains are heavy; medium coarse texture. Flowers & fruits: Clusters of creamy white flowers are borne on short terminal racemes, fruits are pale brown capsules similar to ocotillo, inconspicuous. Seasonal color: Flowers from late February through March. Temperature: Well adapted to Phoenix area. Soil: Fast drained soil is best, found on rocky slopes in native habitat. Watering: Very drought tolerant. Supplemental landscape irrigation will increase growth rate somewhat and vigor. Pruning: Definitely none - this means NEVER, NEVER prune this plant! Propagation: Dug and transplanted easily, propagated by seed (if one can find it). Disease and pests: Root rot is a real possibility if soil drainage is poor and soils are frequently irrigated. Additional comments: Boojum tree is now protected in it's native habitat and across border transport of it and it's seed from Mexico is now heavily regulated. The result of this and it's slow growth rate is that this plat is rare, and very expensive ($). Boojum is a plant of some mystery. The generic name refers to P.E. Fouquier, who was a Parisian medical professor. The specific epithet refers to the stiff and stout upward tapering trunk, which resembles a column or inverted carrot root. The common name of boojum tree is credited to Godfrey Sykes of the Desert Botanical Laboratory in Tucson, Arizona. Sykes named it after a "mythical thing called a boojum found in desolate far-off regions, coined in the book The Hunting of the Snark by Lewis Carrol." The other common name, cirio, refers to a slender type of alter candle used in indigenuous religious ceremonies. 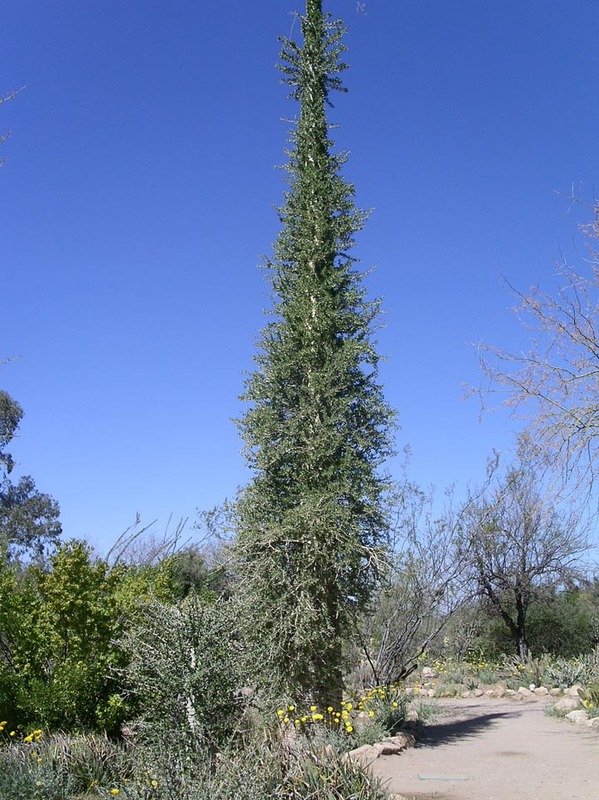 The Boojum Tree is placed into the genus Idria by some authors.